Operation C Game Boy Game Cartridge Cleaned, Tested, and Guaranteed to Work! I am a huge Contra fan. 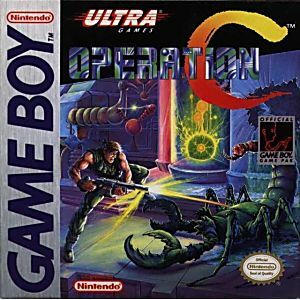 Operation C is an excellent member of the Contra family. I personally enjoy it more than Contra III: Alien Wars for Game Boy. It's Contra on game boy, enough said! All hail contra! While not as good as the original Contra title for the NES, Operation C is a fun Gameboy title, and plays quite well on my Gameboy Advance. Really enjoy it! If you've played any Contra game, this one is no different. A must have if you wish to have Contra on the go! This is the first handheld Contra, borrowing many design similarities to Super C for the NES. The run and gun action holds up fairly well on the Gameboy, and this plays especially well if you're using a Super Gameboy or Game Boy Player to play on a TV. Otherwise, it's a bit blurry and slow to stand up to its superior 8-bit predecessors. Fans of the series will still have fun with it though.